Our latest exhibit, Famous Faces: Picturing Celebrity in the Photographic Archives, highlights over 40 photographs of nineteenth and twentieth-century celebrated personalities and historical icons held in the University of Louisville collections. From gathering and researching these images I have learned a number of interesting facts about a few celebrities related to Louisville. Elvis Presley (1935–1977) is one of the most iconic American celebrities of the twentieth century, having been a hugely popular singer and actor for over twenty years, earning the nickname “The King of Rock and Roll.” But the photos held in the archives of Elvis Presley, performing in Louisville at a special employee party put on by tobacco company Philip Morris, don’t tell the whole story. 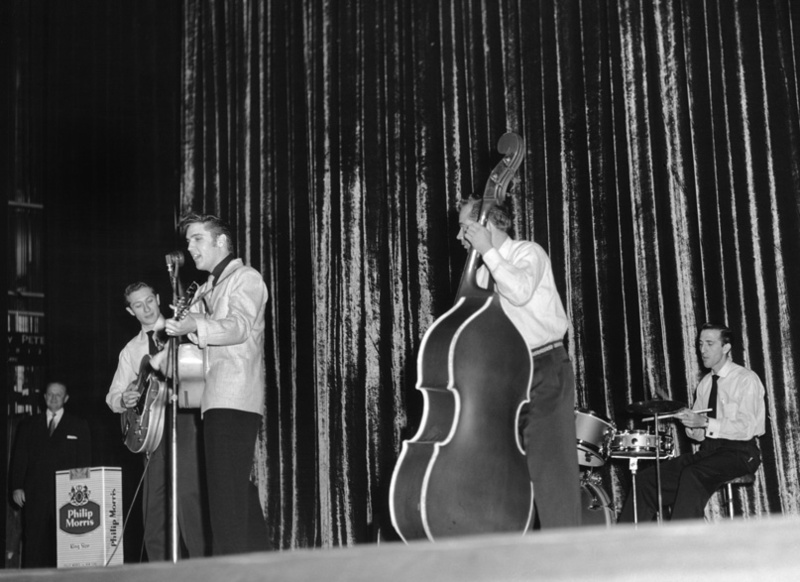 A little research revealed that this show, held on December 8, 1955, was a mere month before Elvis’ very first record was released – “Heartbreak Hotel” in January of 1956. He was an unknown! In fact, it has since been reported that the president of Philip Morris, in the audience during the performance, tried to get Elvis kicked off the stage because he considered the singer’s hip gyrations obscene. The Modjeska, the delectable caramel covered marshmallow candy is an original Louisville creation that is continued to this day by confectioners like Muth’s Candies on East Market Street. It sounded like a strange name for a candy until I learned that it was named after a famous stage actress of the late nineteenth century. 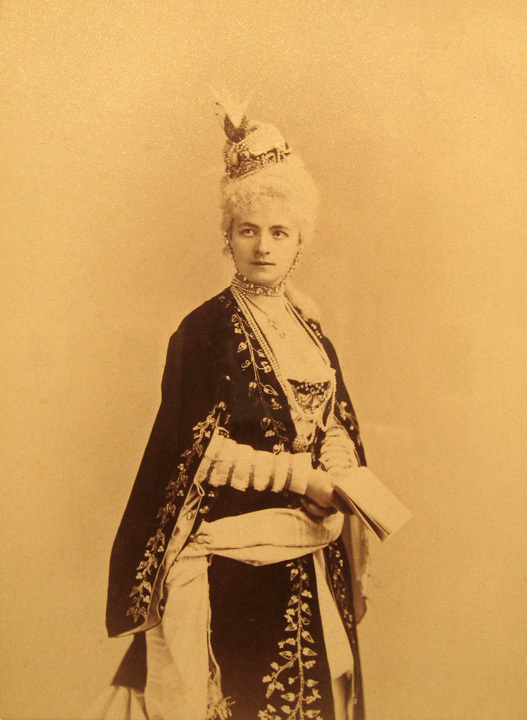 Helena Modjeska (1840–1909) was a Polish-born Shakespearean actress who was hugely popular in the United States after she emigrated here in 1876. In 1883, the year she received her American citizenship, she starred in Henrik Ibsen’s A Doll’s House in Louisville, Kentucky, the first Ibsen play staged in the United States. As a testament to her appeal, Anton Busath, a candy maker who immigrated to Louisville from France, was so infatuated with the actress that after her visit to Louisville he decided to give the “caramel biscuit” confection he had spent years perfecting her name: the Modjeska. Colonel Sander’s in his coffin? It’s not often that we see photographs of celebrities taken after they have died. Sure, post-mortem photography was popular in the Victorian era when families would have a professional photograph their recently departed child or other loved-one to memorialize them; often the post-mortem photograph would be the only image the family had. But this practice went out of style as handheld cameras and snapshot photography proliferated, and as medicine advanced and death became more removed from everyday lives in Western society. It turns out that photographer John Ranard snuck a camera with him while visiting Sanders’ body as it lay in the Taylor-Hall Funeral Home. 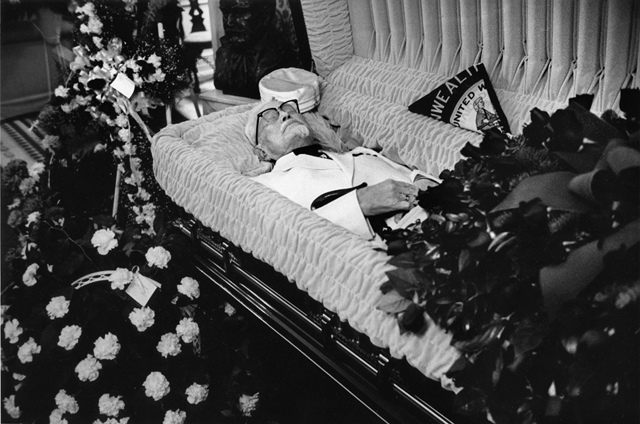 Shooting from the hip allowed Ranard to remain undetected and as a result, we get to see Colonel Harland Sanders (1890–1980), founder of Kentucky Fried Chicken, as he was buried – with his trademark mustache and goatee, white suit, and string tie. Come see the entire exhibit, Famous Faces, up now through September 27th, located in the Photographic Archives Gallery in Ekstrom Library, lower level, Monday through Friday, 8:00 AM – 5:00 PM.